Christmas is the time of year when ancient pagan, folk, and Christian traditions are blended in the most amazing ways. In this article we'll see how a few of those old traditions have survived in new forms. The Yule log which was called uil in Scandinavia and comes from the same root word as "wheel" was a simple folk custom to symbolize of the turning of the wheel of the year. During the week of the Winter Solstice a large log was burned to brighten the dark night, fight off the cold, and burn away the bad luck and sorrows of the last year. The bad things that had happened would be carved into the log or written down and tied to the log before it was burned. In German tradition, the Yule log had to burn for 12 days so it had to be large and had to burned in a large firepit. Hunting and felling the Yule log was a community event. The women would decorate the log with evergreens and holly berries before it was carried into the great hall. Children would dance around the fire and listen to old tales of heroes. Before the log was all consumed, a chunk was rescued from the pit to be stored for next year when it would be used to light the next Yule log thus maintaining continuity from year to year. Later the ashes from the Yule fire were scattered in homes, fields, orchards, and wells to bring good luck. As time went by the Church ascribed additional meaning to the celebration. The light of the fire was said to symbolize Christ bringing light to men's hearts and the holly and ivy that festooned the logs foretold of his death and torture. In the tiny fishing village of Burghead (poulation 1,690) in Northeastern Scotland, they observe a tradition that predates Christianity and maybe even older than the Picts. on the evening of January 11th, which is the Scottish New Years Eve, or Hogmanay, the locals carry a flaming half-barrel of black tar, supported by a thick pole, clock-wise around the town and up to an ancient altar on top of Doorie Hill. The current altar was actually built in the 19th century but the locals believe that it is on the same spot as the original. Here the pole is set in a socket in the altar and surrounded by more broken, tarred barrels and wood. The whole pyre is set aflame where it burns all night. Of course there is much booze consumption. and singing and mischief involved. As pieces break off from the fire whether on its journey around the village or at the altar, they are given to townsfolk and pub owners to keep in their chimneys to ward off evil spirits and witches. This tradition was not limited to Burghead in the Middle Ages but much more widely observed, enough that the Church tried to stamp out the tradition. In the 17th century the young men of the village were rebuked in a Church court for "having made a burning clavie, paying it superstitious worship, and blessing the boats after the old heathen custom." 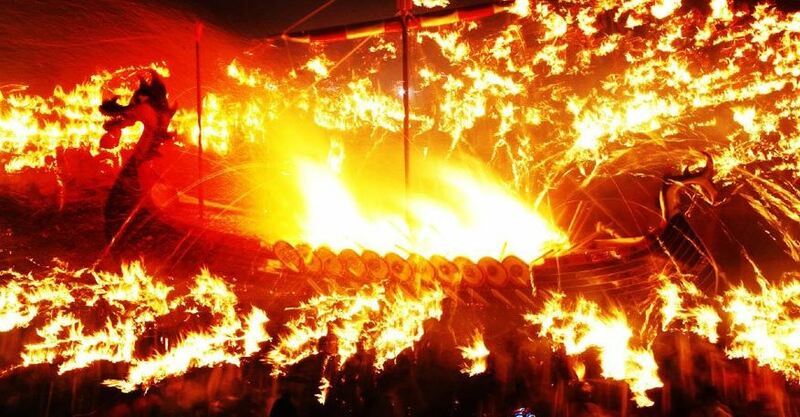 The festival of Up Helly Aa (pronounced UP he lee yah) is observed in several Shetland communities but the largest festival is held in Lerwick on the mail island. Shetland is an archepeligo of islands north of Scotland with the Atlantic to the East and the North Sea to the West. There are only around 25,000 inhabitants in all of Shetland and most of them attend Up Helly Aa. 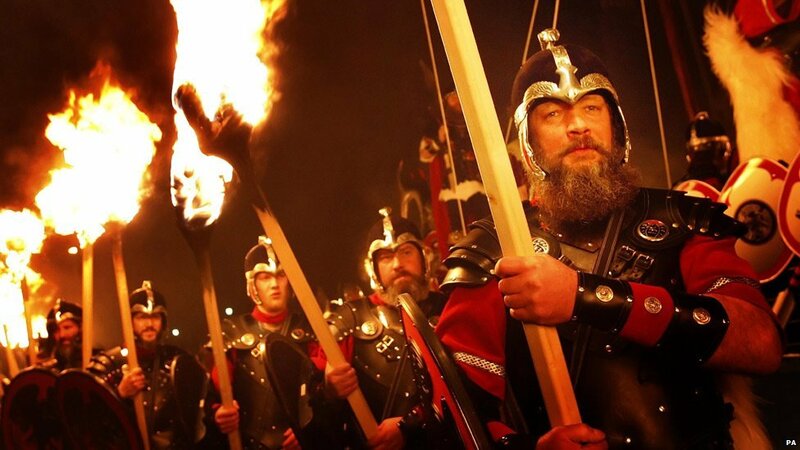 A Viking squad marching in the Up Helly Aa torchlight parade. It began in the 18th century after tar barreling was outlawed due to rowdy behavior. Civic leaders saw a need for a community event in the winter so they obtained permission to hold a torchlight parade. It was such a success that they held another to honor the Duke of Edinburgh and so Up Helly Aa was born. The participants are called guizers which harkens back to the tar barreling days when participants wore disguises. Now they wear elaborate Viking armor. Shetland history was dominated by the Scandinavians until the 15th century when they became part of Scotland so Viking and Norse culture are celebrated in Up Helly Aa. Many squads of Vikings march in the parade and they build a Viking galley of wood. The Up Helly Aa Jarl is voted to lead the parade and its festivities and must have participated in no fewer than 15 Up Helly Aa parades. He and his squad ride the galley through the streets flanked by nearly 1000 torch carrying marchers. 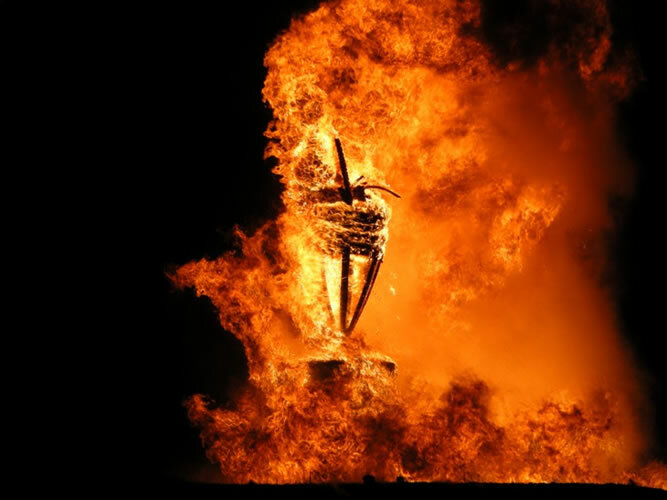 After which the galley is lead to a field outside of town where the parade marches round and round the galley until the Jarl, who has move to a safe distance, signals and all the torches are thrown into the galley creating a massive bonfire. thrown onto the Viking galley. From www.bbc.co.uk. Throughout the town of Lerwick, every school, hotel, and sports venue has been converted into feast halls for private parties. All night long the squads of guizers walk from party to party where they are given food and drink in return for performing a skit, song, or dance. This goes all night long and into the next morning. If you want to add this article to your list of favorites or email it to a friend, please use this permanent URL, https://stores.renstore.com/-strse-template/0901A/Page.bok. Permission is granted by the author to quote from this page or use it in handouts as long as you include a link back to Renstore.com.